The bees and some consulting work have occupied my time, keeping me from blogging about my sparse gardening activities. I am still getting dirt on my hands, planting a little for the fall winter garden as well as prepping the bees for winter. The garden activities have also included photographing and marveling at the growth of my banana clusters. Three clusters of the Manzano and two of the Burro(chunky banana), both Mexican varieties. I suspect the weather will cooperate and allow them to mature before the threat of a freeze heads our way. They do tolerate some cold weather but the freeze this past January was both long enough and cold enough to damage the plants. A sparse bunch of the Manzano variety. A dense bunch of Manazano variety.Very nice to eat, small to medium sized banana tasting a bit like green apples. A project on my loooooooong hunny do list is/was to clean/organize my garage, a three car garage that does house a single vehicle. Lots of bicycles, hive bodies, beer making equipment, tools(multiples of the same type), camping gear and a bunch of miscellaneous stuff left behind when our children moved out. Why am I telling you this in a gardening blog? Well, I started the cleaning process and I am easily distracted, “Look a butterfly”,…..I found some dried bean pods gathered from several seasons back and rather than toss them I wandered out to the garden and planted them. Three days later they are sprouting! A check with google on the time to maturity for the Blue Lake pole bean variety, 60 days or so, and I might get lucky and have fresh green beans by Thanksgiving…. Wow, in just three days this bean is leaping up. Looking around the base of the tepee towers, I see several others peeking through the leaf and compost mulch. More gardening, I have several late summer plantings, a volunteer Matt’s Wild Cherry, a volunteer English cucumber in a pot(producing nicely and an heirloom Brandywine growing nicely. Beets and Swiss Chard are also in the ground hoping to get a good start before it does get cold. The asparagus ferns are starting to die back allowing me time to clear them off and add compost before next spring. Our neighborhood is having its annual yard sale this coming weekend. I have been drafted to help! Yes Dear! I will help…..and have a table set up to sell my honey and jams. I have 40+ pounds of honey and about 40 jars of jams, strawberry, blueberry and blackberry, taking up shelf space. I will report out soon! My wandering mind, always a bit out of control. Yesterday I was trying to cram too many activities into my day…..The guy at the mower shop called for the third time about my leaf vacuum and chipper that had been in the shop, ready for over two weeks….I had bees to feed, beers to drink, weeds to pull, strawberries to pick and the list went on. My fat tired garden wagon was strapped to the rack on the back of my Suburban. I released the ratchet strap and placed the strap inside the vehicle…..got distracted…….maybe the bee swarm trap was attracting attention, another cup of coffee, my 5th, and…..oh yes go get the leaf Vac. Fired up the Suburban and headed off. Arrived at the shop, grabbed a strap to tie down the leaf vac and wandered to the back of the Suburban……..and i luckily made it the 8 miles to the shop with the garden wagon still resting on the rack…..Surprise, surprise. FYI, this is garden wagon number two……..I lost one a year and half ago….it was “strapped” down, but obviously not well. Fifteen miles of freeway driving followed the 6 miles from my house down Kingwood Drive to the freeway. I retraced the route, hoping for the best but, I was worried about a catastrophic event. It became obvious that I was lucky and I suspect someone else got lucky and picked up and $ 80.00 wagon…….maybe a little scraped and dented! The infamous rack and a peek inside my two “seater” Suburban. the wagon wheels are visible on the left side. I may need to invest in a truck soon! A closer look. My “Goo” friend John built me a box to organize my tools….again…my scattered brain always hunting for where the needed tools are. The box will also double a a swarm box if I encounter one…..Love it! What else…..Oh yes the swarm. It is drawing “lookie lu’s”…..today looks promising. I have some old comb in the trap and that is generating lots of visitors into the open house. Fingers crossed. Swarm box with “lookie lu’s”. I hope they like the decor and invite the rest of the group. March 28 and I have lot’s of green tomatoes, Celebrity and Juliet are producing. I have been using my electric toothbrush to buzz pollinate the tomato blossoms….apparently successfully. Check out the old link to my article. On the way back from Bee School in Brenham over the weekend……there is a thread here, trust me, it all makes sense to me, I saw many fields full of the famous Texas Bluebonnets. An iPhone image capture…..wish I had taken my good cameras…..next time! Many, many opportunities to take photos. I am pulling up carrots, picking sugar snap peas…..almost done, getting a few strawberries and waiting on the beets. The freeze killed bananas are shooting up so all is pretty good in my “Backyard Farm”. I went to check on of my 8 frame garden hives a few days ago and had a pleasant surprise. I had left a medium super on top the two brood boxes as this hive seemed to be a little slow this spring. Wow, I opened it up and it was wall to wall of beautiful capped honeycomb. The brood boxes were well filled out so I figured I should provide some room for the ladies! 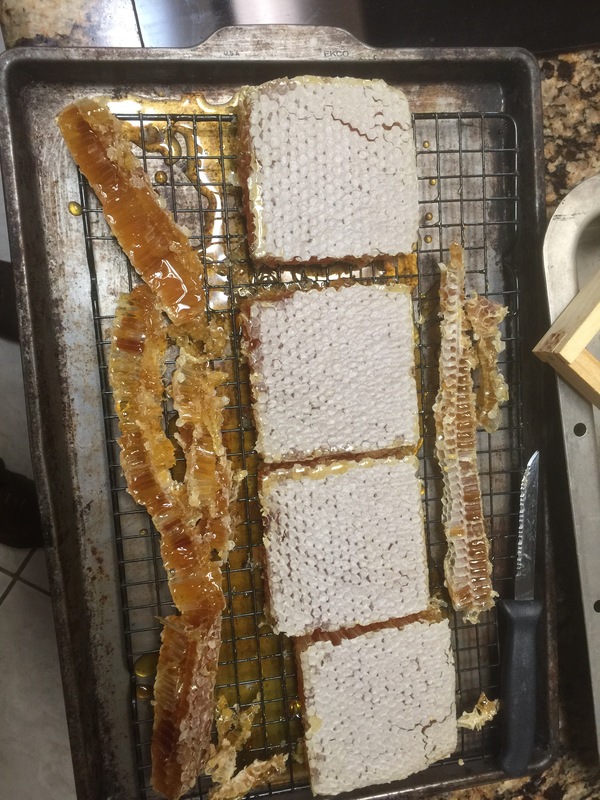 I pulled 4 frames of beautiful honeycomb. I replaced them with 4 four frames of drawn comb. It seems that this urban setting still has some nectar flow. I haven’t fed this hive at all this summer. I added a feeder just to help them out. I will cut 3.25X3.25 inch squares from 2 or 3 of the frames and squeeze the remainder. They look so nice. A garden update, bananas are still my proudest success but the Armenian cucumbers have grown beyond belief! 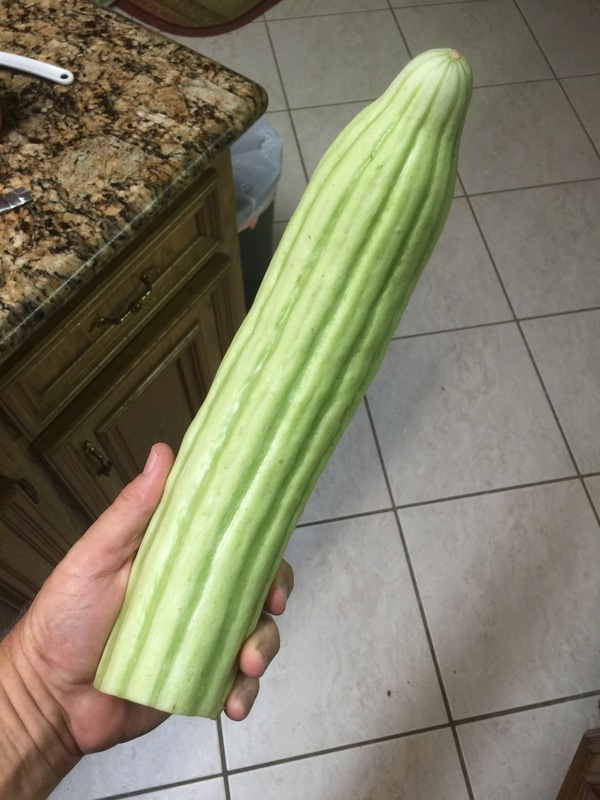 They are essentially a melon, so even the large ones are edible. I am surprised that my relief gardener missed picking them at a more manageable size. The Poblano and Serrano peppers are still thriving. I replanted some tomatoes for the fall and added some more pole beans. Would love to have some relief from the heat and humidity. It was 78 F at 5:45 this morning and only 93% humidity!